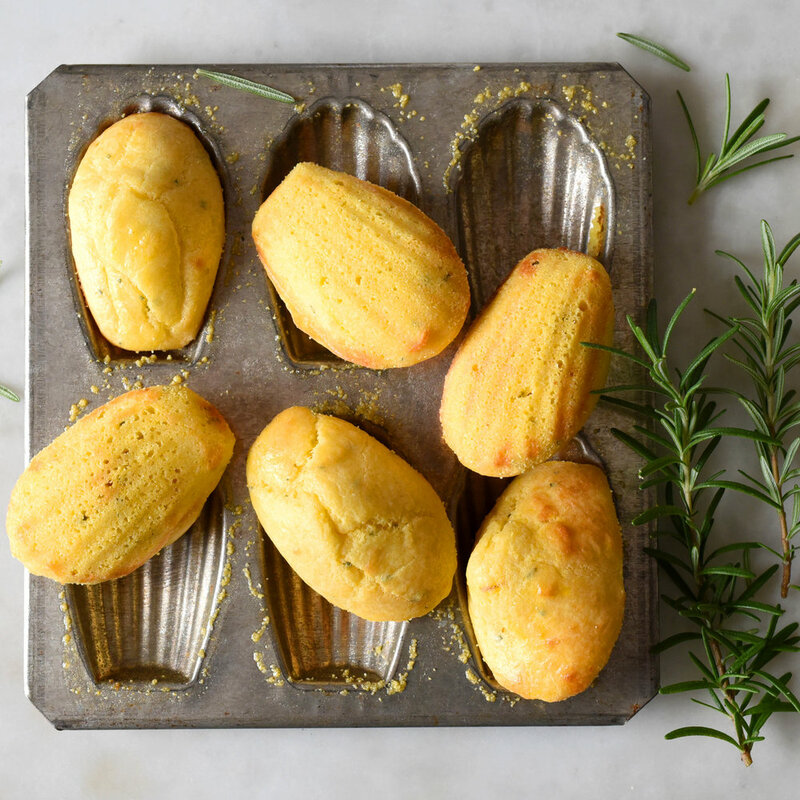 Melt the 20g butter, let cool, and with a pastry brush, butter the madeleine tins. Dust with combined cornmeal and flour, tap out any excess, and place in the freezer. Melt the 50g of butter with the saffron strands over a low heat and cook for a couple of minutes, until it turns a lovely golden colour, and smells delicious. Set aside to cool. In a large bowl, whisk together the eggs, egg yolk, crème fraîche, and milk. In another bowl sieve the flour and baking powder, add the cornmeal and salt, mix together. Add the flour mixture to the egg mixture and stir to combine. Add the Parmesan, rosemary, and lemon zest, fold through until just incorporated. Now pour in the cooled melted butter and saffron, folding through gently. Place in fridge for an hour to rest. Preheat oven to 180C, and remove batter from fridge. Using a spoon, drop batter into the centre of each mould, filling them about three-quarters of the way. Place in oven and bake for 10-13 minutes, until madeleines feel set to the touch. Let them sit in the tins for a minute before turning out, and serve immediately. For another variation, omit the saffron and rosemary, and add 1tbsp either chopped chives, or tarragon. Over a low heat melt butter with honey. Let cool. Combine eggs, castor sugar, brown sugar, salt and vanilla in a food processor. Add flour sifted with baking powder, then add cooled butter and honey. Allow this batter to rest for at least 1 hour, if you have time, overnight is best in the refrigerator. Coat the madeleine tins with the soft butter and dust with flour. Rap tins on edge of sink to knock off excess flour. Put in the freezer until needed. This is important and a tip no one ever tells you about. The madeleines will cook much better if the both the tins and the batter are cold when putting them in the oven. When ready to cook, preheat the oven to 185C. Spoon the cold batter into the cold tins and bake for 10 - 12 minutes. Turn out onto a wire rack and dust with icing sugar. Eat warm with the lavender ice cream. In a small saucepan over a low heat make the caramel with 1/2cup sugar and 2tbsp water. When it becomes a lovely golden colour, pour it immediately into a 24cm metal cake tin swirling it around so the bottom of the tin, and some of the sides are covered. Set aside to cool, it may crack, don’t worry. Peel and core the apples, starting with 10, and slice them thinly on a mandolin, about 2mm thick. Mix the 125g sugar and orange zest together in a small bowl. Place the apples into the caramel lined tin in concentric circles, pressing down firmly, and sprinkling every other layer with the sugar mixture. When you reach the top (you may need the extra 2 apples), cover with baking parchment, press down firmly again, and cover with a piece of foil. Place in the fridge overnight. The next day remove from the fridge carefully as the apples will have released a bit of liquid. Preheat the oven to 150C, place in a deep baking dish on a tea towel, and fill with very hot water to half way up the side of the cake tin. Place in the oven and cook for 3 hours, refilling the water if necessary. After 3 hours, remove from oven and baking dish, and let cool. Replace foil, and place in the fridge overnight. The next day when ready to serve, dip the tin into hot water to loosen the caramel, and tip onto a shallow serving plate. Serve in slices with crème fraîche, or vanilla bean ice cream. Place elderflowers into a large bowl, cover with water, and let soak overnight. The next day, drain elderflowers carefully, making sure that they are clean, and put back into the rinsed bowl. Heat water and sugar over a low heat in a medium saucepan, stirring until the sugar is dissolved. Remove from heat, pour over the elderflowers, cover and leave overnight to infuse. The next day, strain the mixture through a fine sieve, pressing the flowers with the back of a spoon to extract as much flavour from them as possible. Add the lemon and orange juices, the rosé, and chill the mixture thoroughly. Freeze in your ice cream machine and serve in small scoops. Soak the gelatine leaves in a bowl of cold water for 5 minutes. Put cream, sugar, vanilla bean and seeds into a saucepan. Cook over low heat till sugar dissolves. Do not boil. Remove from heat, and take out vanilla bean, squeeze excess water from the gelatine, and stir into the cream to dissolve. Whisk the yoghurt into the cream mixture, strain through a sieve, then pour into 6x 125ml moulds. For the syrup, combine wine with sugar in a saucepan, bring to a simmer, stirring to dissolve sugar, then set aside to cool. Dip moulds in hot water; invert them onto serving plates, place fruit around panna cottas, and drizzle with red wine syrup. If you are not able to find gelatine leaves, use 1.5tsps of powdered gelatine and dissolve following instructions on the packet. Combine the chocolate, butter, and espresso in a stainless steel bowl over hot, but not boiling water, stirring frequently until smooth. Remove from heat and let cool until chocolate is just slightly warmer than body temperature. To test, dab some chocolate on your bottom lip. It should feel warm. If it’s too cool, the mixture will seize when the other ingredients are added. Meanwhile, whip the cream into soft peaks and put aside. Whip the egg whites until they are foamy and beginning to hold their shape. Sprinkle on the sugar and beat until soft peaks form. When the chocolate has reached the proper temperature, stir in the yolks. Gently stir in about one-third of the whipped cream. Fold in half the whites until just incorporated, then fold in the remaining whites, and finally the remaining cream. Spoon the mousse into a serving bowl, or individual little dishes and refrigerate for at least 8 hours. Butter and flour an 11inch tart tin with a removable bottom. Line the tart shell with baking paper and fill with dry beans. Bake for about 20 minutes, or until the crust is a light golden brown. Don’t rush this process, if the weights are removed too early, the sides will shrink. Remove baking paper and beans and bake until it is a rich golden brown and the bottom is thoroughly cooked. Place on a rack and cool completely. When crust is cool, spread the mousse into the tart shell and smooth the top with an offset spatula. Refrigerate, covered, for 8 hours to allow the mousse to set completely. Firstly make your pastry. Process flour, butter and salt in food processor until it starts to come together, add egg yolk, a little milk, and process just until it forms a ball. Remove, shape into a disc, wrap in plastic wrap and refrigerate for an hour. In an electric mixer, beat eggs and sugar together until light and creamy, and then gently fold in vanilla and hazelnuts with a large spoon. Set aside, whilst between 2 sheets of baking paper, you roll out a little more than half the pastry, and place it in the tart tin. Spoon in the hazelnut mixture, and then roll out the rest of the pastry, laying it on top of the tart, and pressing the edges together so they adhere. With a pastry brush, gently brush the glaze over the tart, put it on a baking sheet, and place it into the oven. Bake for 30-40 minutes, until golden brown. Remove from oven, let rest for 30 minutes before serving with spoonfuls of crème fraîche. 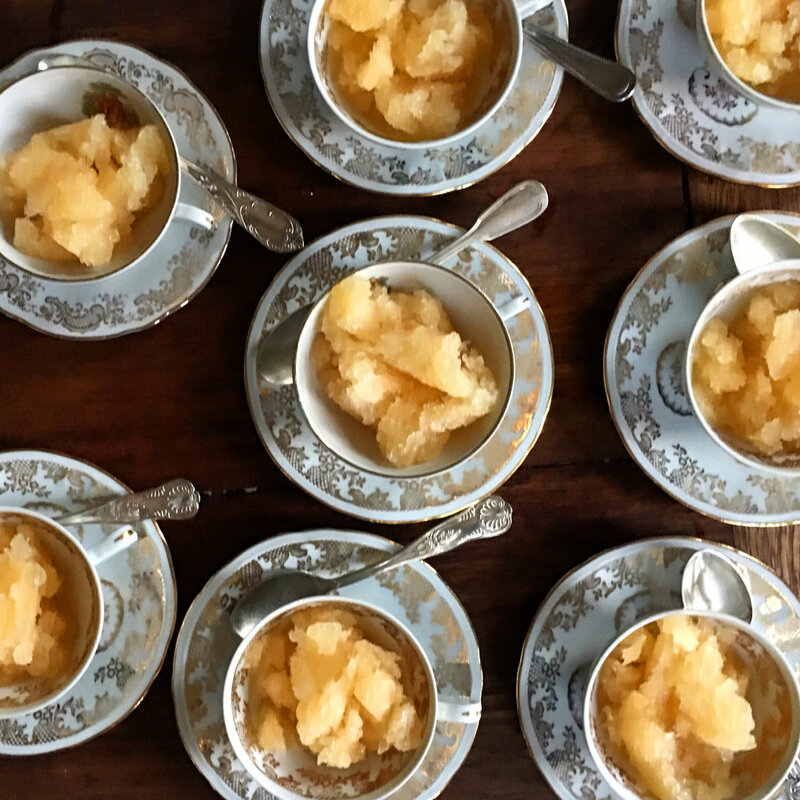 In a saucepan, bring syrup to a simmer with lemon juice, vanilla bean and orange rind. Peel pears, cut in half and take out the cores. Put pears into the syrup, and simmer very slowly until they are tender. This can vary from 30 minutes to one hour depending on the ripeness of the pears. Leave to cool in the syrup and serve at room temperature scattered with the raspberries and drizzled with a little of the syrup. To make the sugar syrup, put 2 cups sugar and 4 cups water into a saucepan and bring to a simmer over a medium heat until the sugar is dissolved. Let cool. And keep in a jar in the fridge until needed. Preheat the oven to 150C, and in a casserole large enough for all the pears, bring the sugar, red wine, vanilla bean and quince paste to a simmer. Peel the pears, leaving the stalks on, and put them into the simmering red wine syrup, covering them with water if necessary. Cover with the lid, and put into the oven for 1 hour. After an hour, turn heat down to 100C, take off lid, and turn the pears over. Replace lid, and bake for another 4 -5 hours, turning pears over every hour. When the pears are tender and very red, take them out and place in a pretty dish. Put the casserole back onto the stove, and over a low heat gently reduce the syrup until it’s a coating consistency: strain through a sieve and drizzle over the pears. Serve with softly whipped cream. Preheat the oven to 180C, butter a 20-21cm square cake tin and line base with baking parchment. Scatter the Demerara sugar evenly on top of the paper and arrange the orange slices, overlapping slightly over the sugar. Sift the flour, baking powder, bicarbonate of soda and salt together. Mix the goat milk and milk together. Beat the butter, sugar and orange zest until light and fluffy, then add the eggs one at a time. Add the flour and a little milk, one after the other, until it’s all mixed together. Pour into the tin over the oranges gently, and bake for 40 minutes. Test with a toothpick, it should come out clean. Let it sit on a cake rack for 10 minutes before turning out onto a plate. Serve with a spoonful of Meredith Dairy Greek style yoghurt. Warm the milk with the honey in a saucepan, then pour it over the lavender in a bowl. Leave the lavender to infuse until the milk is cold. Overnight is best. Beat the egg yolks well and then strain the cold lavender milk into the egg yolks and beat gently to combine. Return to a clean saucepan and over a low heat stir constantly until the mixture thickens and coats the back of a spoon. Immediately pour in the cold cream and stir to combine. Strain into a bowl and set aside until cold. Churn in an ice cream machine according to the manufacturer’s instructions, and freeze. Soak gelatine leaves in cold water for 5 minutes. If using powered gelatine soak in 25 ml water for 5 minutes. Heat the cream with the sugar and the split vanilla bean over a low heat. If you don’t have Coeur à la Crème moulds, I think you could try small clean yoghurt cartons with holes pierced in the bottom. Serves 6, draining time, overnight. 250g very fresh ricotta cheese put through a fine seive. Believe me, the fact it’s fresh makes a huge difference. Fresh raspberries, or raspberry coulis to serve. Beat the egg whites until just starting to peak. Add half of the sugar and continue beating to firm peaks. Lightly whip the cream in a separate bowl. In a third bowl whisk the ricotta cheese with the rest of the sugar until smooth. Don’t overbeat. Add the seeds from the vanilla bean, fold in the whipped cream then gently fold in the beaten eggwhites. Place the moulds on a tray and line with damp muslin cloth. Fill with the cream mixture, cover with the muslin and drain in the refrigerator overnight. Carefully turn out the hearts onto serving plates and serve with berries or coulis. To make crème brûlée, put the cream and the vanilla bean in a heavy saucepan and bring to a boil. Reduce heat and simmer for 5 minutes, stirring occasionally. Set aside. Combine the egg yolks and sugar and whisk together in a bain-marie over simmering water until pale and fluffy. The mixture should become dense but it must not scramble; be sure that the heat is not too high. Whisking constantly, strain the cream into the egg-sugar mixture. Continue cooking for approximately 10 minutes, or until the mixture thickens and coats the back of a spoon. Remove from heat and quickly whisk in the butter. Cover with plastic wrap and let cool to room temperature. Soon the custard evenly into the baked tartlet shells and refrigerate for at least 4 hours for it to set. I have found that even if you leave the tarts in the fridge overnight, the pastry will still be perfect and the custard just firmer. NB/ I have found that 4 hours is not enough time for it to set sufficiently. 24 hours is better, and the tarts will keep for up to three days in the fridge without the pastry softening. In fact, the custard will become denser the longer it is in the fridge. Immediately before serving, sprinkle a small amount of sugar on top of each custard tartlet and caramelise. I use a small blow-torch for this. Put the flour, salt and sugar in the bowl of a food processor. Add the butter and process until the mixture resembles coarse breadcrumbs. This takes about 10 seconds. Add the ice water, drop by drop through the feed tube with the machine running just until the dough holds together without being wet or sticky. Turn out the dough on to plastic-wrap and make into a flat circle with your fists. Chill for an hour in the fridge. Roll out the pastry thinly and place in the tart tins. Freeze any excess. To blind bake, line the pastry with foil and weigh with dried beans and bake in a 180c oven for about 20 minutes. Remove foil, return to oven until golden brown. Cool before filling. Preheat oven to 180C. Triple-sift flour and baking powder into a bowl and set aside. Whisk sugars and eggs in an electric mixer until very pale and tripled in volume. (5-8 minutes). Sift over flour mixture and fold in with a large metal spoon, then fold in the melted butter. Divide mixture among 12 x 8ml capacity muffin tins lined with paper patty cases, filling to 5mm below rims. Do not overfill. Bake until risen and pale golden in colour. (15-20 minutes). Cool in tins for 5 minutes, and then transfer to a wire rack. Using a sharp knife, remove the centre, (about 3.5cm in diameter), to about 1cm deep. Halve each round and set aside. To fill, whip 300ml cream and fold in a few spoons of jam of your choice. Swirl together lightly. Pipe into cakes, set ‘wings’ on top, dust with icing sugar, and serve. 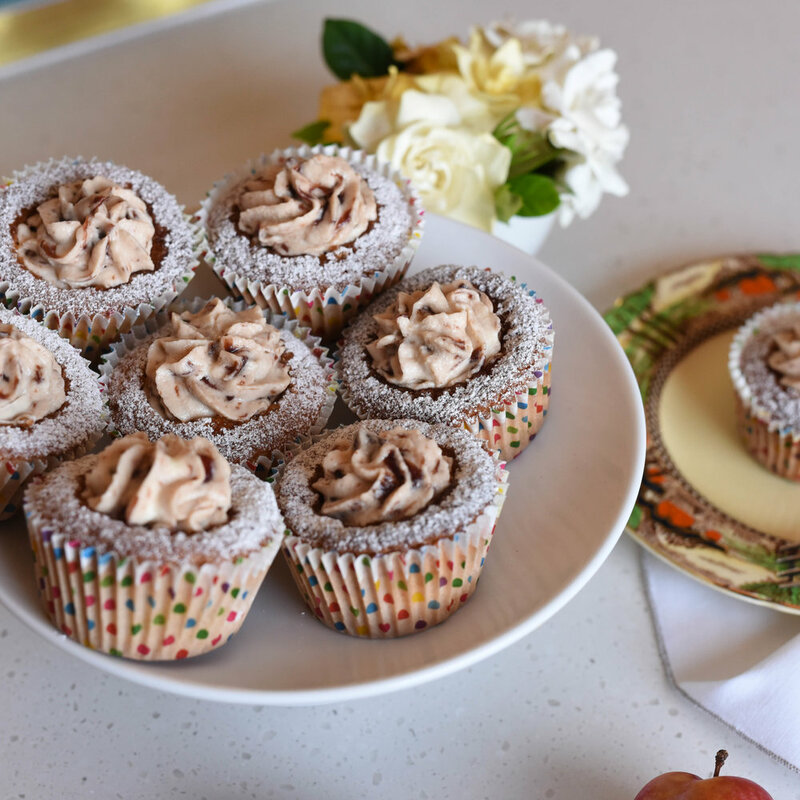 This recipe is slightly adapted from Australian Gourmet Traveller. The function of the egg whites in this custard is to make the custard set as it is cooked. The role of the yolks is to make it smooth. Therefore, the higher the proportion of egg yolks and the lower the proportion of egg whites, the finer the custard will be. However, four egg whites are the minimum for a custard stiff enough to unmould properly. Put the milk and the vanilla bean into a saucepan and bring it to a simmer. Turn the heat off, and let steep for about 15 minutes. Now prepare your caramel. In a small saucepan put the 8tbsp of sugar and 2tbsp water. Over a low heat, cook the mixture slowly. The sugar will start to melt and become caramel. This can take up to 5 minutes. When it is ready, pour the caramel into a 25cm metal cake tin, turning the mould in all directions so it becomes coated. Set aside. Combine the 200g of sugar and the eggs in a bowl and whisk for a few minutes until well combined. Remove the vanilla bean from the milk and scrape the seeds into the egg mixture, and then pour the warm milk into the bowl, stirring constantly. Strain through a fine sieve into the prepared mould, and place it in a shallow baking pan on a tea towel. Fill the baking pan with nearly boiling water 2/3 up the side of the mould and bake in a preheated 150C oven for 1 hour. Test with a toothpick into the centre of the custard, if it comes out clean, it is cooked. Let cool in the mould overnight in the fridge. Unmould onto a large dish with a rim just before serving. There will be a lovely pool of amber coloured caramel syrup surrounding the Crème Caramel, just gorgeous. When you are ready to start baking, remove pastry from fridge, unwrap, and roll out between 2 sheets of baking paper. (This is a very soft pastry, so work quickly with it) You will want a circle of about 30cm diameter for this pie, cut off the excess, and put aside to make leaf shapes. Gently mix the blueberries with the sugar, flour and butter, and place in the centre of the pastry in a rough 20-22cm circle, leaving a 4-5cm border around the perimeter. Bring the sides of the pastry up and over to cover some of the blueberries, just drape it, it doesn’t need to be too perfect, and put back in the fridge on a baking sheet lined with baking paper. With a sharp knife cut the pastry scraps into leaf shapes and set aside. Make an egg wash with the egg yolk and milk, remove the pie from the fridge, and with a pastry brush, gently brush the exposed pastry with the glaze. Now place your pastry leaves randomly around the pastry edge, and over the exposed blueberries. Brush them with a little egg wash too, sprinkle with 11/2tsp sugar, and put back in the fridge for ½ hour while you preheat the oven to 200C. When oven is at the correct temperature, put pie in, and bake for 20 minutes. Turn down temperature to 180C and bake for another 10-20 minutes more. Check it every now and then to see that it is not browning too much, if so, turn oven down a little. When cooked, remove from oven, let sit for 15 minutes, dust with icing sugar, and serve with a jug of rich cream. Put peaches in a glass, I’ve used a large classic Martini shape. Spoon over sugar syrup and Vodka and let sit for a couple of minutes. Top with a generous scoop of Raspberry sorbet, and serve, very cold! Put sugar and water in a small saucepan and bring to a boil. Turn heat down and simmer until sugar is dissolved. Turn heat off, and let cool. Store in fridge until needed. Bring sugar and 1 cup water to a boil in a large saucepan. Cook, stirring occasionally, until sugar dissolves. Let syrup cool. Blitz raspberries and remaining ¾ cup plus 4 teaspoons water in a food processor until smooth. Strain through a fine sieve over a large bowl, using a rubber spatula, pressing down on the mixture gently to extract as much liquid as possible. Discard solids. Add the syrup, stir until well combined, and refrigerate for an hour. Churn in an ice cream maker according to manufacturers’ instructions. Transfer sorbet to an airtight container, and freeze until needed.